When you think of New York, what images come to mind? The Empire State Building? Times Square? Maybe you immediately imagine the Statue of Liberty of that famously gorgeous Manhattan skyline. Most people don’t associate the great outdoors with the Empire State, but there’s more to NY than meets the eye. Upstate New York is a far cry from Queens. The region includes the cities of Rochester, Buffalo and Niagara Falls, as well some outlying rural counties. And here, Mother Nature is alive and well. Shimmering lakes, world-famous waterfalls and tree-lined canyons that stretch across more than 14,000 acres characterize the expansive landscape. Often noted for its eye-popping natural beauty, each season boasts a unique vibrance that takes sightseeing to another level. From crystal white winter wonderlands to the multitude of colors that are born each autumn, the scenic landscape is picture perfect year round. To the benefit of thrill seekers everywhere, the terrain varies greatly which offers a wide variety of major outdoor fun. For water sport lovers, Lake Erie’s regional outdoor recreation service has it all. Kayaking, biking, stand-up paddleboarding, backpacking, fishing and even whitewater rafting! The many freshwater beaches have all of your classic summertime favorites. Video game arcades, ice cream shops, playgrounds and outdoor grills make for the perfect place for a family outing. Speaking of the water, any angler could find happiness here. A favorite local past time is deep sea fishing in Lake Erie. Western New York’s largest inland lake is known to yield record-sized smallmouth bass and walleye. The other four inland lakes–Chautauqua, Findley, Bear and Cassadaga–are filled with pan fish, muskellunge, bass and walleye. There’s plenty of wildlife for hunting, like whitetail deer, wild turkey and bear. In the winter, residents can enjoy cross country skiing or snowshoeing. This landscape was practically made for fun. A mixture of Victorian, Amish and lakeside communities come together to make up the counties of Western New York. Quaint and idyllic, the towns exude more of a village vibe. In Chautauqua County, the arts and culture scene is thriving. Tourists and residents have access to all sorts of options like ballet and theater performances, or live music by the Chautauqua Symphony Orchestra. Off-beat art galleries are also sprinkled around the towns and along the shores of the lakes. The sheer beauty of the region is no secret to the locals, and Western New York sure knows how to capitalize on its natural aesthetic. Charming, country chic bed and breakfasts surround all five lakes, leveraging the landscape. 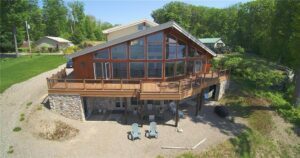 They each have their own unique theme, and they all come with stunning views of pastures, lakes, mountains or forests. One such place is Barcelona Lakeside, a year-round B&B that lies right in the heart of wine country. And Lake Erie Wine Country is simply breathtaking. Also called “America’s Grape Country”, a 40-mile long wine trail snakes through 30,000 acres of vineyards and 23 wineries along the lake’s shores. Visitors can enjoy a wide range of dry, sweet, ice, dessert and specialty wines. Hungry tourists can also indulge in the region’s local cuisine, which runs the gamut from burgers and fries to fine dining. Take your pick of a Tuscan-themed Italian eatery, or enjoy fresh seafood right overlooking Chautauqua Lake. The options are endless. Culture and charm make up Western New York. So sure, Chinatown is pretty cool, but have you ever set sail on a dinner cruise on Lake Erie at sunset? Consider making the Empire State the site for you new lake home. Regardless of the season, you’ll never run out of things to do and sights to see. 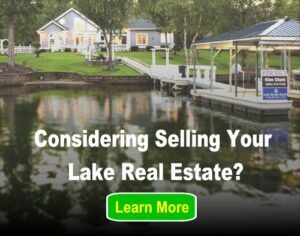 Previous post: When’s The Best Time of Year to Buy a Lake Home?